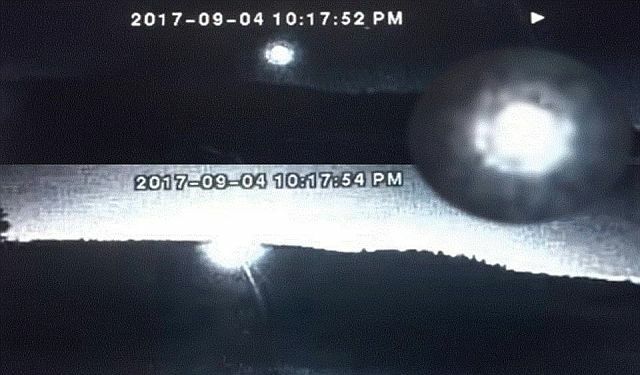 On September 4, 2017 an odd bright object in the sky was caught on the security cam of Jacquie McKay who lives in Bridge Lake BC. According to Jacquie she woke up of the flash. Credit image and video: Jacquie McKay. We felt it. It was way more intense than thunder, but not quite like an earthquake. It rattled the windows. I saw a bright green streak, then the whole sky lit up green! Unlike anything I've ever seen! Was riding home on my bike, and happened to be looking at the sky at the right time. This would explain the odd flashing of light I saw on the horizon when I was outside at this exact time. Spokane WA.